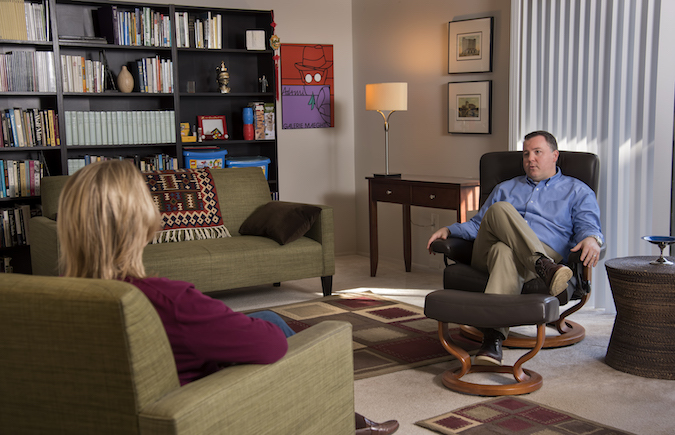 Client Spotlight: Steven J. Hanley, Ph.D.
Clinical Psychologist Steven J. Hanley, Ph.D., is an AnswerConnect client in Southfield, Michigan, just outside Detroit. We asked him a few questions about his practice, how psychology plays into running a business, and more. Why did you go into the profession of clinical psychology? There are many factors that drew me to this field. I think psychology is a wonderful subject to study in college, even if you don’t plan on going into a specifically psychology-related career like counseling or psychotherapy. I am amazed how just about every area of life has something to do with what I learned in psychology classes in college and graduate school. Broadly speaking, psychology is the study of how we think, feel, and behave. That covers a lot of ground! It also leaves a lot of room to explore specific interests. Early on I became interested in the practical application side of psychology to the helping profession. I discovered that I had a knack for listening which is a vital skill of being a good psychotherapist. What do you find most rewarding about the field? Every day I am in the office with someone I am invited into a very special and personal space. So much of my work as a psychotherapist involves helping people tell their stories. Those are often very difficult and painful stories, but I think people find a lot of hope and relief when they can tell them with a trusted professional. To be part of that is a real honor for me. The relationship that develops between someone and their therapist or counselor is probably one of the most unique ones you can find and I enjoy being a part of those. There are a few other rewards about being a psychotherapist that I didn’t really anticipate. First, I have talked with so many people from so many different walks of life that I feel I learn something new every day. I’ve learned a lot about different industries, cultures, religions, and more. Second, the profession has allowed me countless opportunities to learn about myself. How does clinical psychology differ from other forms of therapy? As a field, clinical psychology deals with difficulties that people have with their thinking, emotions, or behavior. These difficulties can range from everyday life stressors, like divorce, parenting issues, and work stress, to significant and debilitating mental illnesses, like depression, bipolar disorder, anxiety or even schizophrenia. Within the field of clinical psychology there are many different methods of treatment. How a psychologist helps people in the consulting room has a lot to do with their particular type of training, philosophy, and even personality. My experience, and I think the research supports this, is that the most important factor in successful psychotherapy is the quality and match of the therapeutic relationship. What is one common misconception about your field? Many people still have the unfortunate belief that you must be “crazy” to go talk with a psychotherapist or counselor. I think the stigma surrounding mental health issues has improved even since I have been practicing, but it is still there. I do a lot through my social media outreach to help educate people and confront this myth about mental health and psychotherapy. I and most of my professional colleagues have been involved in our own psychotherapy and counseling before. For most of us it was a vital part of our education where we could really experience what it was like to be “on the other side.” So, I sometimes lose sight of how difficult it can be for someone to make that first call or email to a therapist. It’s a real act of courage to be able to do that and I try to normalize it and not to take it lightly. You’ve blogged about making connections with your community. Why is that important to you? Developing trust with people and their communities is the lifeblood of my business. As I mentioned in that post, most people in my field don’t learn much about business until they have to run one. That is how I did it. Many “helpers” have a hangup about earning a good living doing this work. In any business you are always “selling” and I think many therapists are uncomfortable with that idea. I’ve tried to embrace it and part of that for me is embracing the community I live and work in. Besides, it just feels good. What has your background in psychology taught you that might benefit an entrepreneur? People want to be heard and feel understood. If you can genuinely do that you are well on your way to running a good business, whether you are selling a product, a service, or your time. While it is not the only thing, I think it has to be the first thing. What is the most challenging thing about running the business aspect of your practice? The things I struggle with the most in running my business are time management and work/life balance. As the owner and only employee of my private practice both of those have been challenging at times. It all falls on my shoulders. There are only so many available hours in the day that I can see clients. I’ve tried to streamline some of the more administrative parts of my job. Technology has helped in that regard and I’ve found some wonderful services and software that are vital to my operations. As my business grew I was able to start hiring out some of these services which freed up some of my time to either see more clients or give myself a break. That is the work/life balance part of my business. I think therapists especially need to pay attention to their emotional and physical self-care. If I am stressed and burned out I am not going to be helpful to people. Ultimately that will hurt me and my business. How do you use AnswerConnect, and what does it do for you as a business owner? I had been toying with the idea of getting an answering service for a while. I was somewhat reluctant at first because of the added monthly expense, but I have been very pleased with AnswerConnect. Most of the day I am in session so I can’t personally answer phone calls. I have a perfectly suitable voicemail system, but since using AnswerConnect I was surprised at the amount of time that I save throughout a week not having to listen to messages. There are also some very common and basic questions that an AnswerConnect associate can answer for a caller and that saves me a few minutes from not having to return a call. It might seem like a little thing, but I’ve realized those minutes add up quickly. Even if I can shave an hour off my work week, and I am guessing it has been more, it is worth it to me. What I have also found is that I am capturing more calls. Like I mentioned earlier, it can be very difficult for a potential new client to make a call to a therapist. Having a real live person pick up the phone is important. Many people are reluctant to leave a voicemail and I found that I was missing a lot of potential clients. They might just move on to the next therapist on their list. Or, worse yet, they might decide to stop their search right then and not get the help that they need. I can’t help everyone who calls me. There are often scheduling or insurance issues that make it impossible. If I can’t help someone who calls I try my hardest to help them find someone who can. To me that is just being a good business person and community steward. Thanks so much, AnswerConnect, for including me in your Client Spotlight blog! Glad to have you guys on my team.